On her journey in India Janneke Raaphorst introduced herself to Swami G. as Janika. He explained her name means flying carpet in Sanskrit. What is a flying carpet if not a vehicle for fantasy, storytelling or travelling? 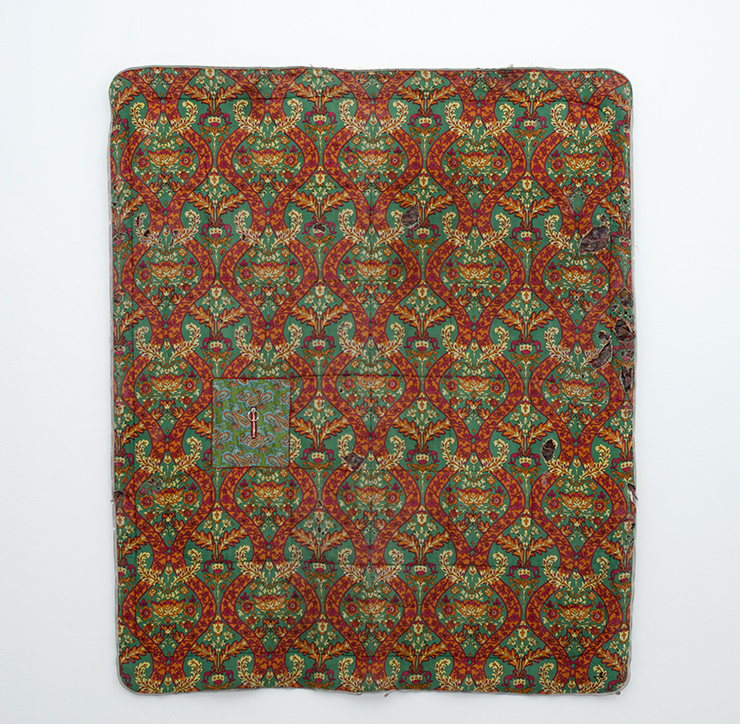 It is an airplane blanket she sewed from textiles she collected on the Silk Road. In her performance Cover/Story Janneke Raaphorst weaves text, textile and context. In the performance Janneke Raaphorst proposes that the smart phone is merely a temporary tool to train human beings in decoding computer generated patterns. She compares the silk QR Quilt of her own hand with ancient Tibetan thangkas depicting mandalas. Mandalas are geometric paintings which can be seen as maps with gates, as manuals to enter a virtual reality. 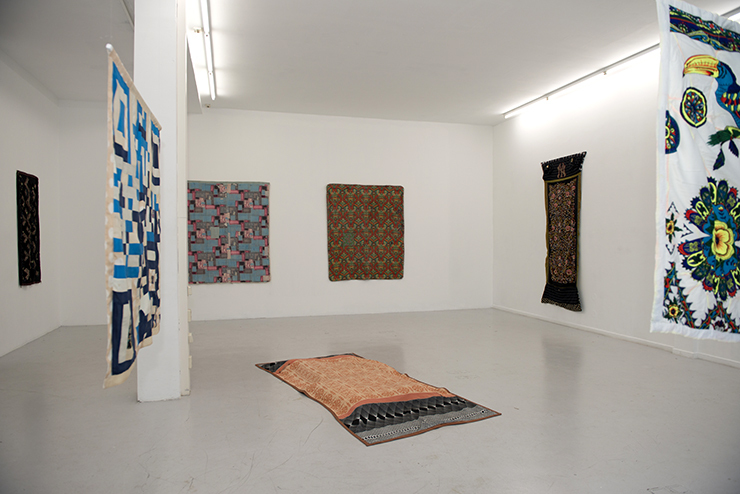 A QR Quilt serves as an interface between the world of handcraft and a digital reality. By studying patterns one can travel worlds. "At least as old as the thangka painting is the distinction between exoteric and esoteric texts. Exoteric texts are those that are to be read, recited, and studied in the ordinary sense. Esoteric texts are to be grasped not through intellectual operations alone but through physical exercise, to experience the sounds of the words. If there is a difference between esoteric text and exoteric text, can there be a difference between esoteric textile and exoteric textile?" PERFORMANCE SCRIPT COVER STORY Hello my name is JANIKA I will be your guide. [workshop falling]. A month ago I went to the Rubin Museum in New York. This museum is specialised in art from the Himalayas. I went there to study the Tibetan thangka. I arrive at the counter. Instead of asking for a ticket I say: Hi. It is me. I am here. The lady gives me a ticket without asking for anything in return. On the second floor the guard asks me whether I am studying. I am taking notes for my work. Have you seen that man over there? He asks and points at a man in a black suit watching a statue. Look at how he is watching the statue. The man is holding his left index finger with his right hand. This man knows everything, go talk to him. Finally I come up with a suggestion. Maybe you can tell me something about this statue? This is the all knowing Buddha, you see he has four faces. He shows me how to put my hands. Close your eyes and visualise the statue. A thangka is a painting on cotton or it is silk applique usually depicting a Buddhist deity, scene, or mandala. A mandala is a geometric painting. It can be seen as a map with gates. Watching the mandala offers acces to another world. It serves as an interface to a virtual reality. Unlike a painter with personal inspiration, these paintings are executed by craftsmen. They work along preset compositions set out by a priest. The background is painted first, followed by the figures. After the eyes are coloured in, the priest will sign the thangka. He leaves his handprints in red paint on the back. When this eyeopening ceremony is done, the thangka is activated. It is ready for use as an educational tool for the ones who study or practice Buddhism, to identify deities, or identify oneself with one of them. [open eyes one after the other] [fold the Japanese Shue Uemura blanket and connect clip] This is the portrait of Shue Uemura. She was a painter in Japan. [pass behind Melanie blanket. Look out of the window.] Why do people keep books on shelves? When the story is finished, why to hold on to the text? Is a book dead when it is not being read? [A4] In Tibet stories survive by oral tradition. Bards, who today we call singer-songwriters, use a certain technique. A bard becomes one of the protagonists and delivers the story as in a trance. Literate or not, it is not uncommon for them to hold an empty sheet of paper and see the text appear on the page. At least as old as the thangka painting is the distinction between exoteric and esoteric texts. Exoteric texts are those that are to be read, recited, and studied in the ordinary sense. Esoteric texts are to be grasped not through intellectual operations alone but through physical exercise, to experience the sounds of the words. If there is a difference between esoteric text and exoteric text, can there be a difference between esoteric textile and exoteric textile? [go to Jan sleeping bag] This blanket for instance is functional. It is a sleeping bag. It has a pocket. This is functional. There was a hole because the dog was looking for his bone. When looking at colours you see the light colours wear out first. Can you read the patterns of destruction? Do you need a manual to read this blanket? Or is the blanket its own manual? [at Suzanne Valadon blanket] This is the portrait of Suzanne Valadon. Is it possible to enter her world observing this blanket? She modelled for painters like Toulouse Lautrec and Edgar Degas who encouraged her to paint. She painted mostly female nudes, female portraits, still lifes, and landscapes. She made a portrait of Eric Satie with whom she had a short affair. [at the India train blanket] This year I travelled to India to practice Martial Arts. The gold and red pattern of my training shirt reminds me of the weapons and colours of the training space. After training I took a train north. In order to travel light I started sewing a blanket from excess clothes. Three girls saw me sewing. They looked at each other, giggled and joined me. One of them stretched her arms out to show the loose buttons of her burka. We sat together for the next half hour while I fixed her sleeve. I had to leave the train, they had another 72 hours to go. In the pelgrim town Rishikesh there is a man called Swami G. I joined his jam session with a couple of 15 year old boys and anyone attracted by the sounds of the speaker. Sounds of people singing in various qualities echoed over the river Ganges. My mother called me Janneke. For international reasons I introduce myself as Janika. Swami G. asks what my name means in my language. I explain there is John from the bible who we call Jan and that it is common while making the name female to create a diminished form by adding -ne and -ke. Your name sounds perfectly Indian to me. Do you know the story of Lord Rama? He sends his wife Sita out on a jahn. Swami G. is looking for the english word and starts describing a floating square to travel with. He speaks about flying carpets and tells nowadays jahn is even a common word used in the airline industry. He explains in India it is also a custom to make names female and small with -i and with -ka. So my name, jahn + i + ka means Small Female Flying Carpet. In our company was a young sadhu dressed in orange. He had a huge golden watch and an even bigger smart phone. He told us he had a secret. He showed a video of school children in England singing in Sanskrit with an undeniable British accent. He reveiled the secret, Sanskrit is the future language of computer programming. Why is this secret? I asked. Because you can earn a lot of money with this. Isnt that the reason to keep it secret? This is how to prepare for the future. He said. But how does it work? Doesnt it have to do with the functional element in computers, the silicon chip. The atoms of this synthetic crystal are piled up like the fruit on the cars on the side of the road here. Atoms piled up in the most efficient way reduce the fraction of light and cause the material to be transparent. As far I understood computers work with a binary language, 1s and 0s alternating. When the choice is between two options only, one or the other, we can speak about vibrations. The frequency is the result of how many vibrations happen per time unit. Since Sanskrit is known as the language resonating in clear frequencies, I assume when these clear Sanskrit syllables resonate with the clear crystal, it must result in a high quality digital performance. But computer programming language isn’t spoken. It is a dead language. What difference does it make whether the commands are written in English or in Sanskrit? Written language is made from letters. And letters are agreements. [ask who has the paper with the letters on it] Anything that distinguishes itself from other things by its own pattern - by shape, color, or movement - is a letter. That is, a letter-s identity derives from differentiation, the way in which it differentiates itself from other letters; and difference holds primacy over identity. Each letter therefore embodies what Buddhist philosophers refer to as emptiness, for there is no such thing as essence inherent in every letter that is prior to its difference from or relation to other letters. Not only the letters of the alphabet but all things in the world - even trees, mountains, and streams - have the same claim as letters, and together they form the cosmic text. The universe is the ultimate scripture of emptiness. As a result, there is never a hard and fast distinction between text that describes the world and the world that is described in the text. [the QR code Quilt] Before I left Swami G. and the young sadhu, I got my business card out. 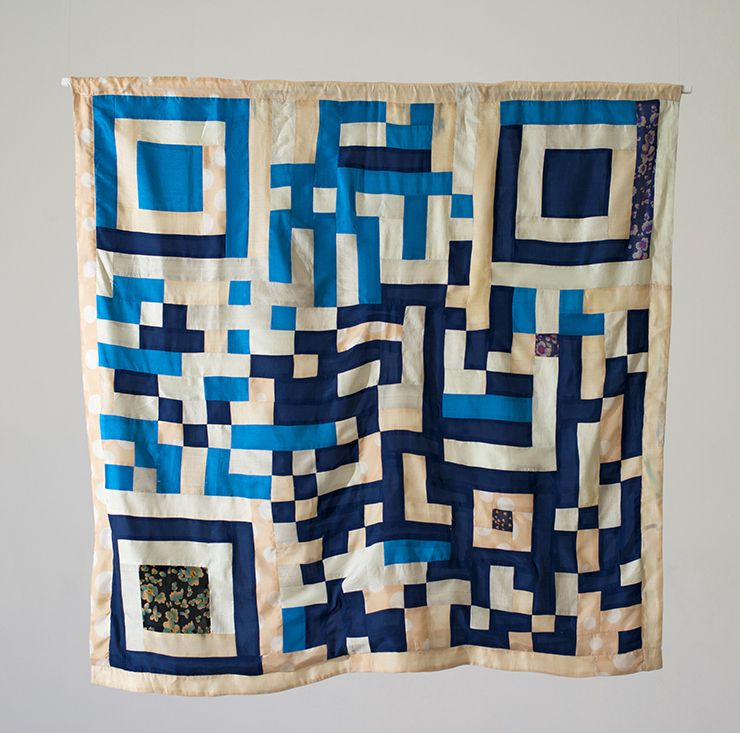 It holds an image of this QR code quilt. QR stands for quick response. To reveal my identity I will elegantly open my shawl and allow people with a smart phone to scan me. [small pause] The code leads to my website, my page on the internet. The fact that it only works under certain conditions says something about being human. In terms of generating coded patterns computers still score higher in reaching precision. 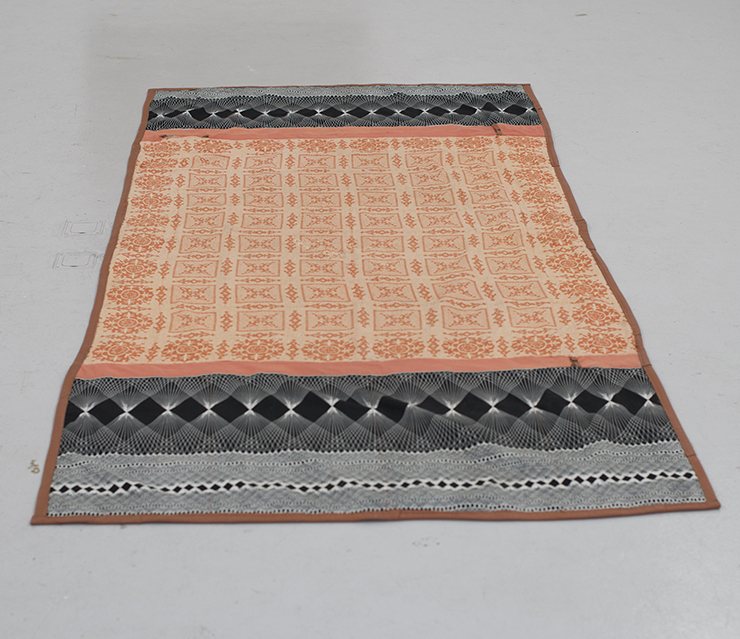 This blanket serves as an interface between handwork and digital information. It is a gate that grants you acces to a virtual reality. At the moment we need the smart phone to scan. But this is probably only temporary. When you will take a good look at the pattern of this blanket you get acces to another world on your own. Be my guest. Thank you.